“March” (Top Shelf 2013) by John Lewis is an important book by an important person about an important event. But more importantly, it’s a great read. We then cut to 2009—inauguration day for President Barack Obama. Lewis is now a long time U.S. congressman representing Georgia’s District 5. Two African American kids are coming to visit him in his office. Lewis tells his story of growing up the son of a tenant farmer, his raising chickens in Alabama, the “Jim Crow” deep south. In college Lewis meets Martin Luther King and other civil rights leaders and he’s inspired to work alongside them. The “colored” populations of southern cities like Montgomery and Memphis boycotted the downtown stores for leverage to have their rights instated. How was this organized? In churches, preachers from the pulpit called out, Everyone who did not spend money downtown this week please stand. It’s always a matter of economy. The white businesses needed the patronage of black customers. This is how African Americans wielded power. John remembers that the older “colored” generation would make concessions to the white people. This felt like a betrayal to the younger idealistic generation. In the end it was the youth—college, high school, even junior high students—who held out and won the real battles for black rights. In order to test the new desegregation laws, John and other students sat at Nashville Woolworth lunch counters. Instead of being served, they would be arrested. As chair of the Student Nonviolent Coordinating Committee (SNCC) at age 23, he was the youngest of the “Big Six” leaders of the civil rights movement. He was a planner and keynote speaker at the famous March on Washington, August 1963. 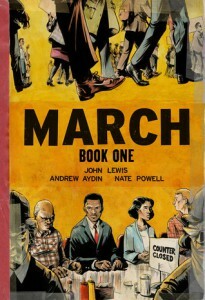 The creators of “March” liken their comic to the 1957 publication entitled “Martin Luther King and the Montgomery Story,” the one that first educated John Lewis and his teenage generation. You can Google that and download it as a PDF. The “March” artwork delivers details, vistas, and emotions of the times, with brush and pen with such sophistication you forget it’s in black and white. After reading Book One we can all look forward to Books Two and Three. Patricia Hruby Powell is a nationally touring speaker, dancer, storyteller, occasional librarian, and children’s book author. Her biography Josephine: The Dazzling LIfe of Josephine Baker will be released January 14.
this is an interesting interview with John Lewis, his co-author Andrew Aydin and Brad Meltzer an author of other best selling civil rights books.